A misconception is that people only require self-storage when they’re relocating their house and require a place to store their possessions in the interim. But the fact is that storage units are used by all kinds of people for diverse purposes. Businesses regularly use self-storage units and have experienced their flexibility. The major benefits that businesses can avail by using self-storage units have been explained below. You may have restricted space to store your stock if your business deals mostly online or you work from home. Renting a self-storage unit is the ideal solution when your business grows. A self-storage facility can be the right solution to a lot of storage and efficiency problems you may encounter in your business no matter whether you have an online business, you work from home or you have a business premises. The advantages of renting a self-storage unit could add to the overall success of your business. Most often business premises are packed with stock, equipment and paperwork. In many instances, much of this is not used on a daily basis but you still require access to these items even if you don’t use them on a regular basis. Consider putting such items into a self-storage facility, it will create more space at your premises. This can also help your business look more professional and also lower the risk of trip hazards lying around. There will be times when you have stock, which you aren’t prepared to sell, but you still need to store them some place. Likewise, if you are in the business of selling seasonal items, you will not want to allocate space all year round at your premises because it could be put to good use for something else at other times during the year. Renting a self-storage unit is the ideal solution to this dilemma; you can store your stock safely and only pay for the space you need until you’re prepared to sell the goods. Suppose, your business is doing well and your thinking of expanding it. You may require a bigger premises to accommodate this growth in the long-term. However, in the short-term, you can store your surplus stock or equipment in a self-storage facility until you’re prepared to handle the bigger move of buying or renting a bigger business premises. People involved in various businesses consider storage units to be a better option to store things compared to leasing bigger premises primarily because of the cost difference between the two. Suppose, you opt for bigger premises, not only will you have ongoing rental charges, you will also have other overheads to deal with like rates and utilities. Henceforth, a storage unit proves to be more cost-effective because you are just paying a small rental charge every month for the space you need with no outgoings. If you want to lower your costs and increase your profit margins then this option you should definitely take into account. Numerous businesses store files and data about their past clients, associates, customers, deals or patients. It is vital to archive this historical data for future reference; however, these records may end up occupying a lot of space that could be put to better use. Storing historical data at a self-storage unit is certainly a better way to store the documents securely and safely, which help to free up the space for maintaining current records. Companies would want that their goods to remain safe. Using a self-storage unit is a brilliant way to make certain the security of stock, equipment, or files. You will be the only one to have the access to the unit as you will be the only one to have the keys. Business owners get access to their self-storage unit as and when they want. Their goods remain safe and secure and storage units can be easily rented without any hassles compared to renting a larger premise. You only need to pay for the space you need and for as long as you want it. 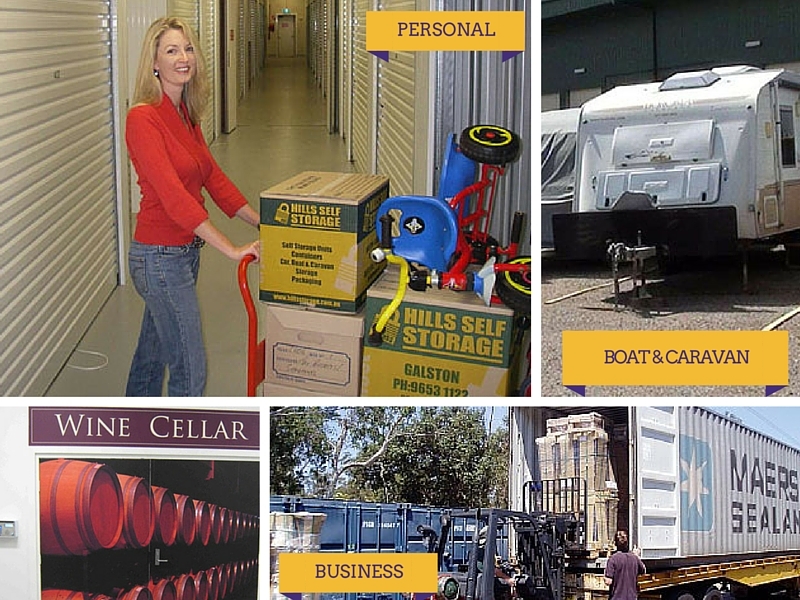 Hills Self Storage provides different options of self-storage in Sydney like personal storage, business storage, boat and caravan storage, car storage, wine storage and more at three different locations including Castle Hill, Galston and Kings Park. If you are looking for storage options, Hills Self Storage provides different options of self-storage in Sydney like personal storage, business storage, boat and caravan storage, car storage, wine storage and more at three different locations including Castle Hill, Galston and Kings Park.